No matter if you are giving a presentation to one person or a thousand, proper planning and practice will ensure its success. Business professionals spend their days consumed with meeting madness. One study discovered 71 percent of senior leaders believe meetings are an unproductive waste of their time. Research says the average business leaders endure 23 hours a week of meetings. With more than half of the workweek spent sitting through presentations, it’s easy to see how they can become monotonous. How can you overcome the innate and overwhelming dread professionals feel when attending yet another presentation? You prepare, plan and practice. Ensure the presentation is catered to the audience’s needs and compiled in a way that is captivating and intriguing. Defining your audience will help you create a presentation best suited to their needs. Understand how your topic is relevant and how it will benefit their needs. Know what they expect to learn and take away from their time with you. Don’t assume the audience thinks like you. Demographic biases can often separate our ways of thinking. The more you know them, the more effective you can make the presentation. Consider the audience’s level of expertise so you don’t lose their attention by speaking over their heads or insult them by presenting basic knowledge. 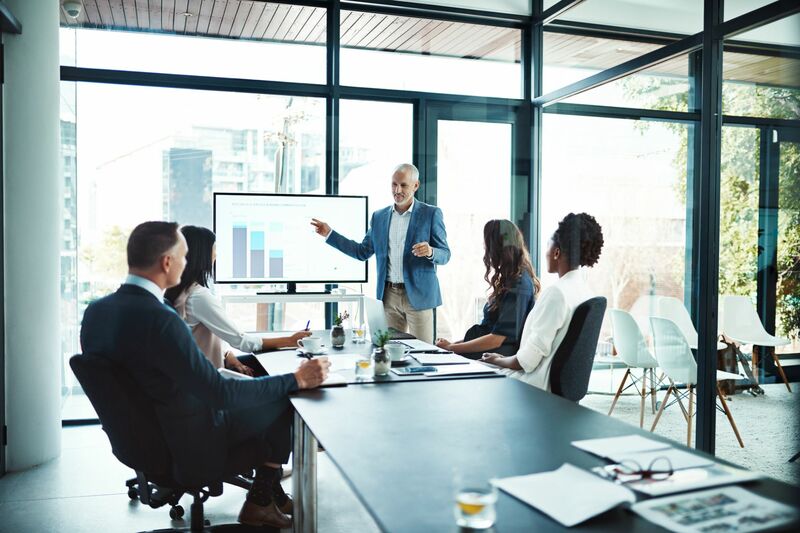 Executives may be more eager to learn about how your topic will impact their business growth, projection and prioritization. Mid-level managers will be more interested in learning the hands-on requirements, experience and implementation needs for your ideas. If you’re unfamiliar with the audience, speak to the meeting organizer before you begin planning your presentation. Ask who will be attending and what they hope to learn. If you are presenting to a client or prospect, research the company, leaders and organizational priorities online as much as possible. Content is critical in making your presentation a meaningful use of time. Content must be correct, factual and well-organized. Ideally, you would have the opportunity to understand your content before giving a presentation; however, sometimes we must present on topics outside of our comfort zones. In this case, take time to research everything you can about what you will discuss. Arm yourself with data that supports your message and helps provide answers to the most likely questions. It’s not enough to have historical knowledge of the topic but how that knowledge will benefit the audience. When you understand their needs, you can tailor your research and fact-gathering accordingly. Ensure your data is factually accurate and easily cited, especially if you are presenting to an audience that is well versed in your presentation topic. Nothing can undermine your credibility more than citing incorrect data as factually accurate. How you deliver a presentation is a critical piece of the message itself. Your goal must be to engage your audience and influence them to act upon what you have to say. Invest time choosing a presentation method that resonates with your audience, maintains their attention and clearly articulates your data. Your method of giving a presentation must connect with your listeners. Knowing your audience and scoping a topic is essential to earning their attention, and choosing the best delivery method is key to keeping their focus. It’s not just about the message itself but the way you deliver the message that impacts others. Design a captivating visual aid that is sure to hold your audience’s attention. Your slides aren’t meant to be front and center — you are. Keep the slides simple so your audience keeps their focus on you rather than on the visual aid. Your message is more important than the slides. Refrain from using too many bullet points when you can discuss the facts aloud instead. Keep animation to a minimum. You don’t want audience members to lose focus and become distracted by the frame swipes, noises and movement. Lastly, less is more. Research shows text is counterproductive to learning. Visuals make a strong impact on listeners, aiding in memory retention. Don’t use 10 words if five will do. Keep the data on your slide short, and use powerful images to make an impact. Once you’ve set up your slides and begin practicing, you may find the content needs reorganization. You may discover information flows better in a different sequence than first thought. Use the slide-sorting feature to change the slide order as necessary. Mindfully considering the sequence and flow of data will also help you remember where everything is throughout the presentation. In case you need to jump ahead to answer a question, you’ll have a better idea of where the information is. Nothing can lose an audience’s attention quite like that of a presentation running over time. Since professionals spend so much time in meetings, they are likely operating on a tight schedule and have somewhere else to be. When you practice your presentation, time yourself. One rule of thumb is to ensure your presentation can fit within 80 percent of the time allowed. If your presentation has an hour allotted, practice giving it in 45 minutes. This ensures there is adequate time left for questions. It also provides wiggle room in case key personnel are late or conversations run long. Keep your answers clear and concise. Don’t elaborate on a response when it isn’t necessary. Brevity ensures time for everyone’s questions. When you prepare for your next presentation, consider the experience your audience desires. Create a presentation that is unique, simple and straightforward. Allow your message to remain in the spotlight with only support from your slides. Mind your time and you’ll make such an impact on the audience that they will be influenced to act upon what you have to say.